Tx1 is a simple short-range DSM2 transmitter. It is available in three versions: 'Tx1-J' with a built-in joystick allowing it to operate as a complete hand-held transmitter; 'Tx1-M' as a module for converting older transmitters to 2.4GHz DSM2 and 'Tx1-K1' which accepts a RS-232 control input. The 'M' version requires a PPM input, is switchable between JR and Futaba channel ordering and requires some DIY skills to install. Download the user instuctions for: Tx1-J, Tx1-M or Tx1-K1. Tx2 is module which can be used to make a DSM2 transmitter with 7 channels. The range is suitable for indoors and small outdoor sites. Each channel is controlled by a variable resistor or switch. The firmware supports trims, reversing, variable throws, mixing and inertia. 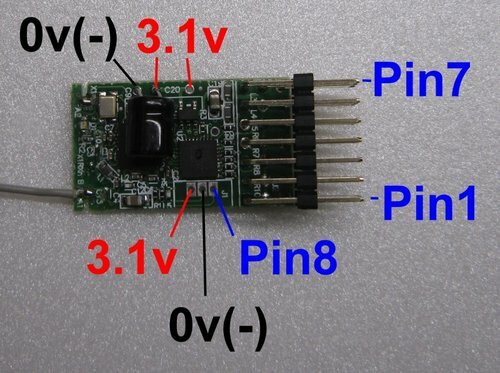 It is a short-range transmitter that works with all DSM2 receivers. Tx2 is ideal for DIY projects; it requires soldering external resistors, potentiometers, switches, battery and LED. It has features for control of model vehicles, especially trains: speed, direction, inertia and lights. Tx2 supports several profiles which provide a combination of analogue and digital inputs. Most of these are designed for use in the Tx2x transmitters. Tx2 is supplied configured with Profile 1 and this can easily be changed. Click on the Profiles tab for details. See Deltang Tx2 Transmitter Module for usage information and example circuits and Tx2 Wired for details of the pre-wired version. Seven profiles are available to suit different needs. Unless specifically requested, Tx2 is supplied set to Profile 1. The Tx2, like most DT products, is in continual development to improve facilities. This table describes the most recent firmware versions and provides a link to the instructions for that version. If your Tx2 has an earlier version number, and you would like to access more recent functionality, the firmware can be upgraded for the cost of return postage. Please contact us before sending your Tx2. v207 Ch6 same as Ch1 in Profile 2 for train cruise control. Added 100% throws option to digital ports (was analogue only). v206 Changed Pin7 to 'analogue' in Profiles 1, 5 and 6. Added Pin7 calibration in Profiles 1, 5 and 6. LED1 off after 1 minute to reduce current consumption. Added ability to change whether Pin6 pot controls Inertia, Ch4 or Ch5 (Profiles 1 & 6). Fixed bug which prevented profile changes and frequency changes from being saved. v205 Added Profile 7 for Tx27. v204 Ch6 same as Ch1 in Profiles 1, 5 and 6 for train cruise control. Calibration only possible in 1st 60 seconds of switching Tx2 on. Added calibration of Ch2 and Ch6 in Profile 3 for Tx23 (all throttle pots). Added ability to control Ch7 in Profile 1, 5 and 6.
v203 Added Profile 5 for Tx20. Added Profile 6 for Tx21. Moved Inertia from Pin4 to Pin6 in Profile 1. Added ability to control Ch4 in Profile 1. Added calibration of Ch1 in Profile 3 for Tx23. Removed mixing in Profile 4.
v202 Added calibration function for Ch1 and Ch2 in Profile 1. CB2 is a transmit controller. It provides the same functionality as Tx2 but does not transmit. It outputs a 7 channel PPM stream with 3.1V swing and idle high. It is intended for use with a high power RF module to make a longer range transmitter. The image shows CB2 connected to an Orange RF module (this must be obtained separately). CB2 can be used to upgrade any of the Tx2x model train controllers to higher power. 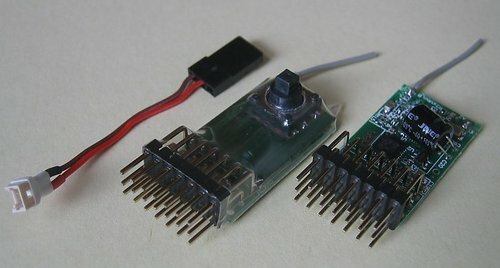 Simply replace the Tx2 with a CB2 and connect to a Spektrum or Orange RF module (e.g. the Orange 2.4GHz DSM2/DSMX DIY Transmit Module). 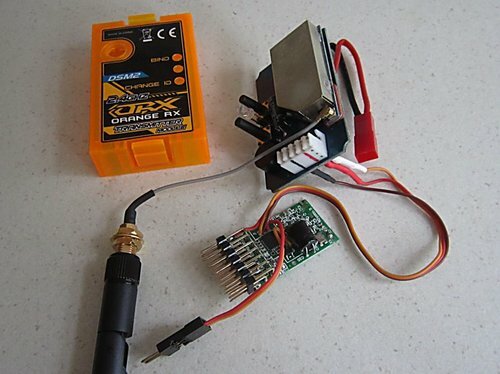 The Orange DIY transmit module provides a simple way of building a full-range (100mW output) 2.4GHz R/C transmitter. It requires a PPM input signal - e.g. from the DT CB2 or the trainer socket of a non-2.4GHz transmitter. As supplied, the module expects JR/Spektrum input channel ordering (TAER). The firmware can be be reloaded with a version that maps Futaba input channel order (AETR) and outputs JR/Spektrum channel order.